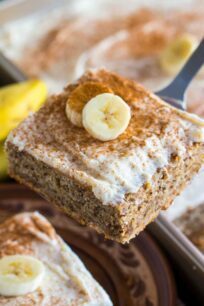 Banana Nut Cake is a breeze to make! Sweet, nutty, slightly chewy, crunchy and topped with the most amazing cinnamon cream cheese frosting. This is a perfect and easy way to utilize those overripe bananas. 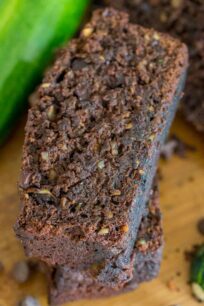 Like my other popular recipes Best Chocolate Banana Bread and Chocolate Banana Muffins, this cake will be the perfect excuse to eat some bananas for breakfast! 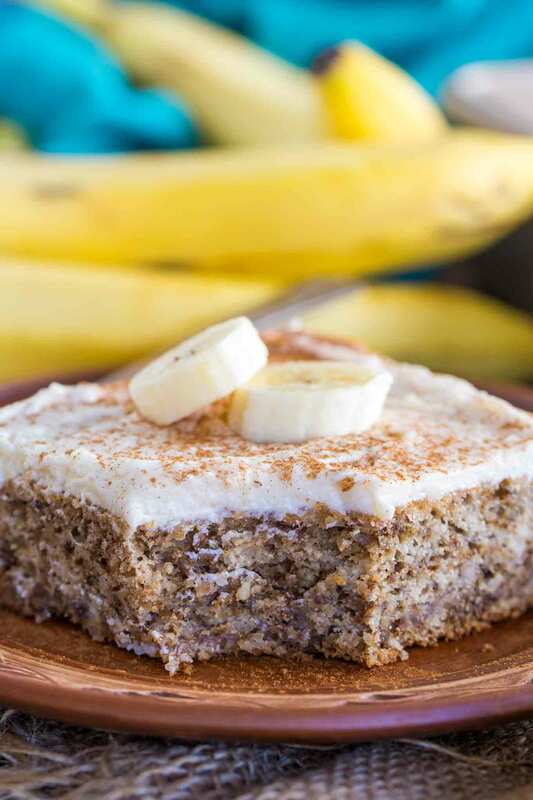 Banana Nut Cake is one of the easiest desserts you can make with overripe bananas. This fool-proof recipe will amaze your taste buds and it will become your “go-to” easy dessert. 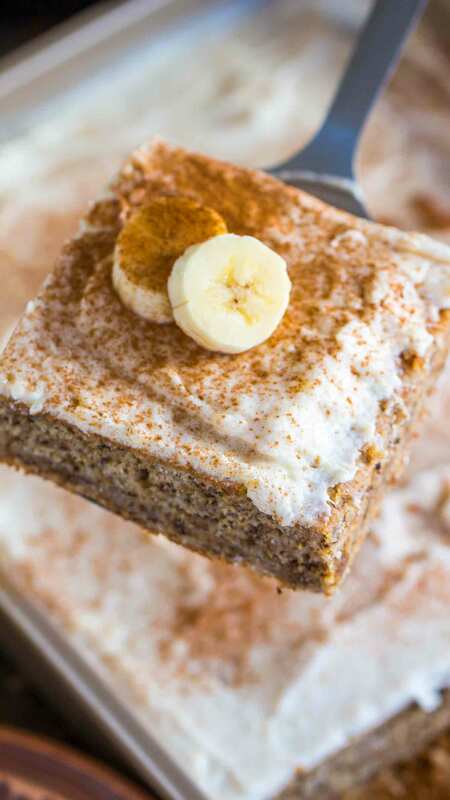 You can serve this Banana Nut Cake sprinkled with a dash of powdered sugar or if you want to go all in, top it with the most amazing cinnamon cream cheese frosting. Dense, slightly chewy, with notes of banana, nutmeg and cinnamon flavor with tiny bits of nuts thru all the cake. 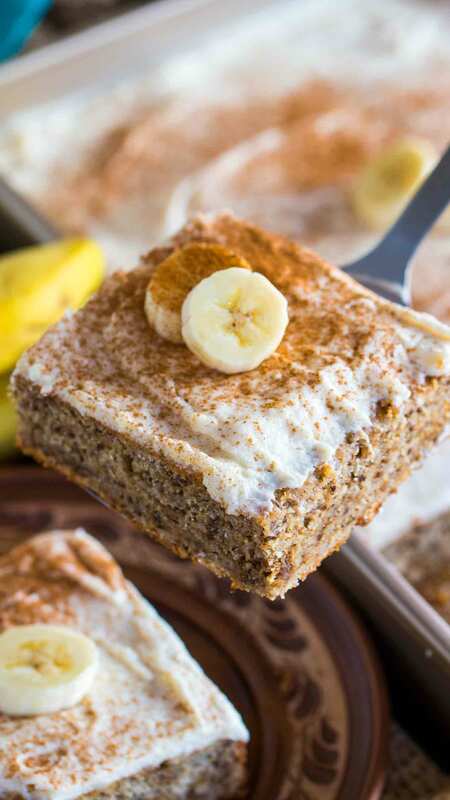 The banana flavor shines in this case, and you can use this recipe to make a Banana Nut Loaf. If you love some chocolate with your bananas, just add some chocolate chips to the batter, or even better, some peanut butter chocolate chips! 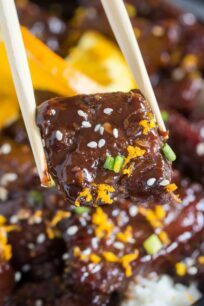 It is rich in banana flavor and moist, this is a show stopper dessert. 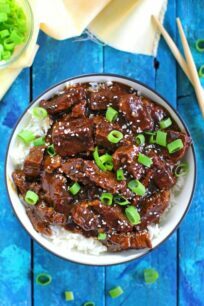 Easy to find ingredients and minimal prep work and dishes to clean. Also, I like to use larger chocolate chips, as they don’t fully melt when baked and are amazing when you bite into them! 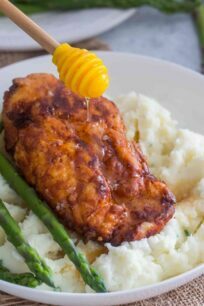 I like to use a mix of white and brown sugar in this recipe, it combines well with the flavors from the bananas and also it locks in moisture, which gives the cake that irresistible crumb. Similarly, the chopped walnuts are optional. So, skip them if you don’t like walnuts or replace them with pecans. To make the cake moister you can add 1/4 cup of canola oil, vegetable oil or even olive oil! Also, you can use melted coconut oil. 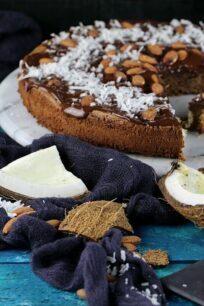 This Banana Nut Cake also tastes amazing with peanut butter chocolate chips or regular chocolate chips. The cake is dense, so it will not rise a lot in the oven, that is ok.
Watch the cake closely after 40 minutes of baking, to make sure not to over bake it. Check on it every 5 minutes until done. A toothpick inserted in the center of the cake should come out clean or with a few crumbs, but not raw batter. How Long Will Banana Nut Cake Stay Fresh? 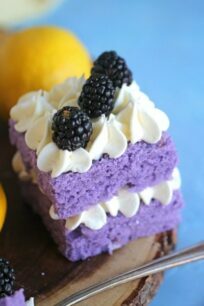 The cake can be stored in the fridge in an airtight container for 4-5 days. Can You Freeze This Banana Nut Cake? Yes. This cake also freezes well. Cool the cake completely and do not frost it. Fully wrap it in plastic wrap, tightly. After that wrap in aluminum foil. Freeze for up to 3 months. Defrost in the fridge before topping with frosting or before slicing. 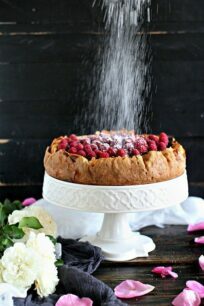 9×13 Cake Pan – this is exactly the cake pan I have used and you see in the pictures. It is not sticking, and I swear by it, such good quality. Preheat the oven to 350°F (177°C). Grease a 9x13 inch pan and set aside. Using a fork or a mixer mash/puree the bananas until almost lump free. In a medium bowl whisk together: flour, baking powder, baking soda, cinnamon, nutmeg and salt. Set aside. Using a mixer fitted with the paddle attachment, beat the butter on high speed until smooth and creamy, for about 1 minute. Add white and brown sugar and beat on high speed for 2 minutes. Using a spatula, scrape down the sides and up the bottom of the bowl as needed. Add the eggs and vanilla extract. Beat on medium-high speed until combined. Add the mashed bananas and with the mixer on medium speed, beat to combine. With a spatula, scrape down the sides and up the bottom of the bowl as needed. With the mixer on low speed, add the dry ingredients in three additions alternating with the buttermilk and mixing after each addition just until incorporated, careful not to overmix. With a spatula or with the mixer on low speed, stir in the very finely chopped walnuts. You can also grind them in a food processor if you prefer a finer texture. Bake for 45-50 minutes. Start checking on the cake after 40 minutes, as baking time may vary. A toothpick inserted in the center comes out clean and the cake will look golden with slightly brown edges. If the top of the cake is browning too quickly in the oven, loosely cover it with aluminum foil. Remove the cake from the oven and set on a wire rack to cool completely. Using a high speed mixer, either handheld or stand mixer, beat the cream cheese and butter together on high speed until smooth and creamy. Add 3 cups powdered sugar, vanilla, and cinnamon. Beat on low speed for 30 seconds, then switch to high speed and beat for 2 minutes. Add two more cups of powdered sugar and beat to combine. Stop and scrape the sides and bottom of the bowl as needed. If you prefer the frosting thicker, add extra powdered sugar 1/2 cup at a time. Spread the frosting on the cooled cake. Refrigerate for 30 minutes before serving. 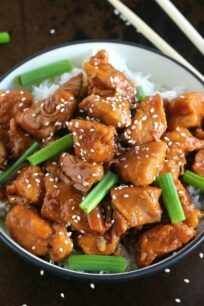 mmm..these look and sound sooo good!! I can’t wait to try them! This looks absolutely amazing! Saving to make soon! 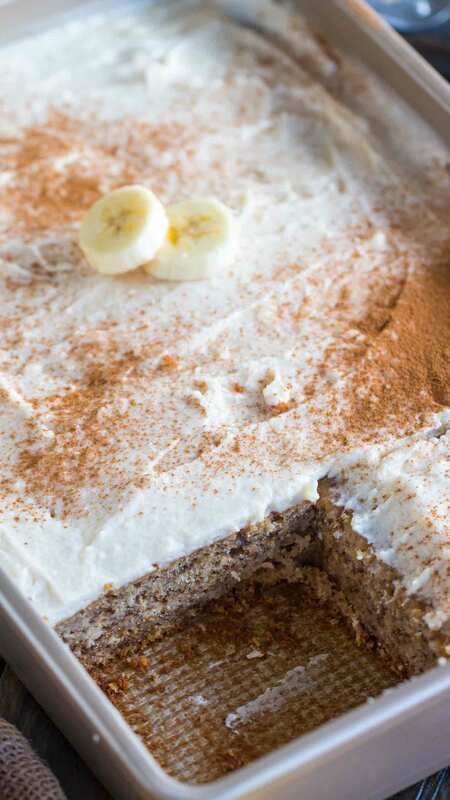 I’m a huge fan of banana nut bread so I definitely need to try this cake! I would love to try this! I have some bananas I could use right now! Wow! What a great dessert option! I am always in for a cake that involves banana! Definitely saving this recipe for later. I am wishing I had a slice right now.